Sherri Franklin is making up for lost time. Until age 35, she hadn’t so much as walked a dog, let alone shared her home with one. These days, however, she lives amongst an entire pack. Franklin is the founder of Muttville–a sanctuary for senior dogs whose time has come to… keep on living. Emphasis on living. Though comfort and quality of life are primary concerns, Muttville isn’t just hospice care or an infirmary with a clever name. It’s not her aim, she says, to prolong life simply for the sake of staving off the inevitable. Rather, it’s to make sure healthy, older dogs can continue to thrive–and to give dogs who’ve never known affection and compassion a chance to experience it before they go. 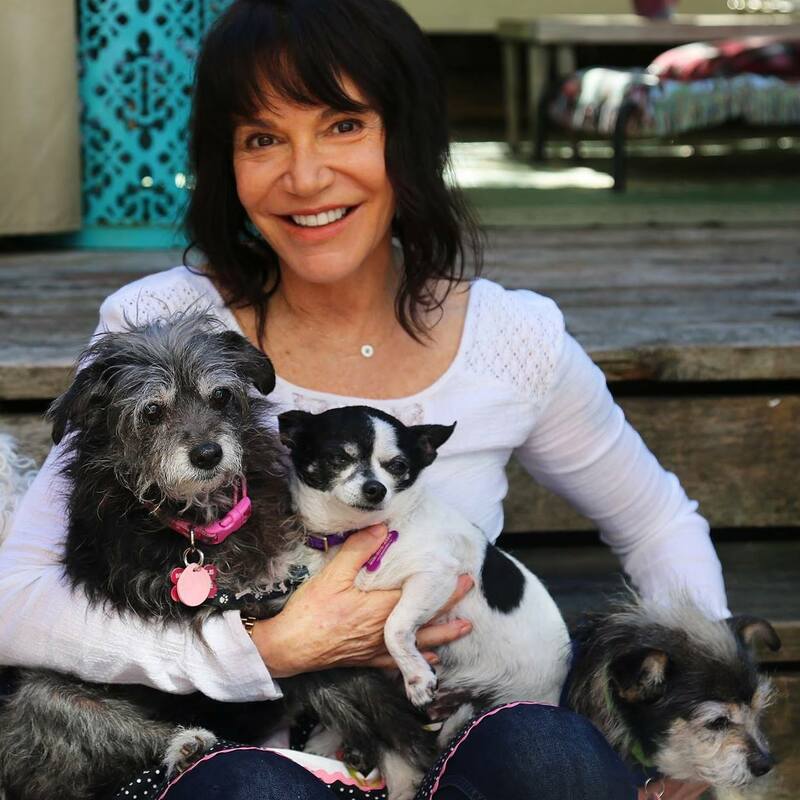 To listen to the Road to Rescue interview with Muttville founder Sherri Franklin on Animal Radio Network, click here. Franklin’s house is quintessential San Francisco: Victorian style with hardwood floors, built-in bookshelves, and art (mostly canine related) lining the walls. Coming from a mere one-dog household, I stand amazed as she handily corrals the group of seniors from the living room to the backyard for a pit stop, and then back into the kitchen for breakfast. And as she stirs together a mixture of raw food and chicken broth–specially fortified with nutrients for older dogs –the pack gazes patiently up at her, as if they have all the time in the world. Among shelter populations, seniors are not exactly the first ones to be snatched up. Even perfectly healthy dogs who still have years of life in them get passed over for younger pups. Franklin insists though that with their slower pace of life and their housetraining days behind them (in most cases), they make for ideal pets. And if fact, she’s successfully adopted out over one hundred senior dogs Muttville has taken in during the last year and a half. As Franklin shares details of Muttville’s beginnings, I gravitate toward a particularly mellow guy–one of the few larger-sized dogs–and ask for his story. It’s all too common: Charlie and his two siblings been chained up outside for months, as well as suffered other abuse and severe neglect. Franklin tells me that the other two dogs were so traumatized, the most merciful option was to put them down. But Charlie seemed stronger, there was light in his eyes. “He’s still suffering a bit of Post Traumatic Stress Disorder, but he’s come a long way,” she says. As he burrows his head into the crook of my elbow, I lean in and kiss his ear, wondering who his lucky adoptive parents will be. Because it fills such a niche need, Muttville is well known–and highly regarded–around the San Francisco Bay Area. Calls and emails pour in on a daily basis from individuals and shelters up and down California, asking Franklin to take in their old, but often highly adoptable, dogs. Simply responding to the influx is a full-time job, not to mention caring for the animals themselves. It’s not, however, how Franklin pays the bills. She earns her living as a hair stylist, but devotes at least as many hours in that capacity as she does to running Muttville. Fortunately, Franklin is not alone in her efforts to see the organization continue to grow. A dog nanny comes regularly to provide companionship, go for walks, and administer medication when she is not at home. Franklin also relies on a small cadre of volunteers and about a dozen foster families to help house the animals. And, Muttville is an official 501(c)3 nonprofit agency, which means Franklin depends on donations through the website, muttville.org, to help keep it operating financially. She’s grateful for them all, including the network of drivers who help transport the dogs, sometimes hundreds of miles, to her home. “It’s almost like an underground railway,” she says. “We meet at truck stops or gas stations off the highway and dogs are transferred from one car to the other.” Still there’s no getting around the fact that Franklin hasn’t had a day of vacation in the year and a half Muttville has been up and running. After breakfast, a pair with incontinence issues are coaxed back outside to relieve themselves. For the most part, the dogs are free to wander in and out as they please, and a few seem to prefer the gorgeous backyard – with its multi-layer wooden decks, hanging plants, and lush greenery – to the comfortable cushions indoors. Click here for scenes from Muttville. Follow Muttville on Facebook.